350 mm L/42 SK C/144 х 2 pcs. Initial HE Shell Velocity815 m./s. Initial AP Shell Velocity815 m./s. 150 mm L/42 SK C/0914 х 1 pcs. Prinz Eitel Friedrich — German promo premium Tier VI battleship. Prinz Eitel Friedrich, unlike other German battleships, is primarily a medium-range fighter with limited brawling capabilities, as a result of: good secondary armament, semi-decent main guns, and non-existent turtle-backed but durable armor. Where Prinz Eitel Friedrich really shines is with her anti-aircraft armament. Her long-range aura consists of eight dual 105 mm dual purpose mounts, allowing her to reach a maximum range of 7.6 km and to benefit from Manual Fire Control for AA Armament. Prinz Eitel Friedrich is also quite fast for ships of her tier, allowing her to close to within her ideal engagement range quite quickly. Her good armor and AA will keep her safe while doing so, and captains should have no problems handling her in a brawl, however brawling should be kept to a minimum (due to her non-existent turtle-backed armor). Captains used to the play style of German battleships should be right at home when sailing Prinz Eitel Friedrich. Rapid reload on her main battery guns. Excellent anti-aircraft suite which benefits greatly from Manual Fire Control for AA Armament. Formidable secondary battery with a long range of 7.6km when fully specialized. Fast for her tier, with a top speed of 28 knots. Feigned fragility - her armour is quite durable for a battlecruiser. Despite having a bad dispersion, her main guns are more accurate than guns on most German battleships. Dispersion of the main battery guns may be inconsistent. Does not get maximum effect from Manual Fire Control for Secondary Armament due to being Tier VI. Despite having durable armor, unlike the rest of her German battleship peers, she doesn't get the signature turtleback armor, making brawling hazardous. Main guns, do an inconsistent amount damage to targets. As a premium ship, Prinz Eitel Friedrich doesn't have any upgrades to research. 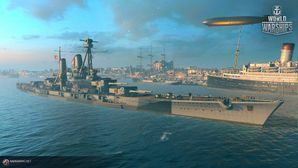 Prinz Eitel Friedrich Has the standard upgrade slots and choices for a tier VI battleship. A standard battleship build will work well for her, but she also has strong anti-aircraft power for tier 6, so if one enjoys ruining a carrier's day, mounting anti-aircraft modules can also work. Key skills for Prinz Eitel Friedrich commanders include Priority Target, Expert Marksman, Basic Firing Training, and Advanced Firing Training. Premium variants of the consumables are recommended to improve performance in battle. As a premium ship, Prinz Eitel Friedrich comes included with Type 10 camouflage that lowers her detection radius, reduces the accuracy of incoming shells, reduces her repair costs, and increases the amount of experience she earns. Prinz Eitel Friedrich captains should mount standard signal flags to improve the ship's performance in battle. Sierra Mike ( ) flags are recommended to increase the ship's top speed. India Delta ( ), India Yankee ( ) and November Foxtrot ( ) flags should be mounted to improve the ship's survivability. November Echo Setteseven ( ) flags can also be mounted to increase the ship's anti-aircraft damage. Lastly, economic and special signal flags can be mounted to increase the ship's economic gains per battle. A side profile of what the Mackensen-class would have looked like. Following the Derfflinger-class, a class of battlecruisers was ordered that would maintain the protection and speed, while increasing the caliber of the main armament to either 340mm or 355mm in four twin turrets. Following long debates about whether or not battlecruisers were actually needed, and how these should be built with what kind of priorities, a design was proposed which left most parties satisfied. As the displacement should not get too large, yet the demand for larger guns remained, sacrifices in armor had to be made to allow a ship to fulfill the speed requirement. The hull was 223.1m long overall and 30.9m wide, with a draft of up to 9.3m. Standard displacement was projected with 31,000 tons, while a fully loaded ship would displace 35,500 tons. Standard complement was slated to be 1,186 men, of which 46 would be officers. One of the key features of the Mackensen-class was the increased caliber for the main artillery. As a result, the main armament consisted of eight 35.5cm guns mounted in four twin turrets, arranged in a manner similar to the preceding Derfflinger-class. Firing a 600kg shell, these guns were capable of maintaining a theoretical rate of fire of 2.5 rounds per minute per gun. The range of the gun varied depending on the mountings that were intended. While initial plans deemed a 16° elevation to be sufficient, war experiences demanded 20° elevations. These numbers were later raised to 28° for a maximum range of slightly above 28 kilometers. The secondary armament was planned as fourteen 150mm guns mounted in casemates below the deck. With a rate of fire between five and seven shots per minute and a maximum range of 13.5km, these guns would have fired 45.3km heavy AP or HE projectiles. Anti-aircraft armament consisted of eight single mounted 88mm guns, and five underwater-mounted torpedo launchers would theoretically allow these ships to torpedo their opponents. The armor of the Mackensen-class greatly deviated from that of preceding capital ships. Unlike the Derfflinger-class, no turtleback was present, and instead the vertical protection consisted of a belt with 300mm thickness, which would thin out to 150mm for the upper belt and the lower edge. Behind that only a 50-60mm strong bulkhead would protect the machinery and magazines. Horizontal protection featured a 30mm deck over the vital areas, and a 25mm deck above. Protection of the main armament consisted of 250-290mm barbettes, while the turrets were armored with 320mm faces, a 180-190mm slope, 200-210mm strong sides and a 110mm roof. The conning tower had 300-350mm strong sides and was protected from above with a 100mm roof. The machinery of the Mackensen-class consisted of sixteen boilers, of which four allowed the usage of both oil and coal, while the rest were purely coal-fired. They would produce the steam for four Parson-turbines for an overall rated 90,000 shp. Thisgave the Mackensen-class a theoretical top speed of 28kn. 3,940 tons of coal and 1,970 tons of oil would allow for a Cruising Range of around 8,000nm at 14kn. Prinz Eitel Friedrich is depicted in a fictional 1941 refit; construction of the real ship was cancelled in February 1918 and broken up in 1921. Prinz Eitel Friedrich was built for the Imperial German Navy. She is instead depicted flying the Kriegsmarine flag and wearing Baltic camouflage from the Nazi-era. Historical World War I configuration based on its finalized design is missing. In-game description falsely claims that the ship entered service in 1914. Line-drawing of the Mackensen class. Unfinished battlecruiser Prinz Eitel Friedrich (left) and Bayern-class battleship Württemberg in Hamburg after the war, in about 1920. This page was last modified on 12 March 2019, at 07:28. This page has been accessed 53,423 times.